Baen Books has announced the winner of the fourth annual Year’s Best Military and Adventure Science Fiction Readers’ Choice Award. Kacey Ezell won for her short story “Family Over Blood,” which came from the anthology Forged in Blood, edited by Michael Z. Williamson. Like all the stories in Williamson’s anthology, it takes place in his Freehold series. The award-eligible stories appeared in The Year’s Best Military and Adventure SF, Vol. 4, edited by David Afsharirad, and the public was asked to pick one of the 15 short stories in his anthology as the award-winner. The winning story was announced at Dragon Con in Atlanta on September 1. The author receives an inscribed plaque and a $500 prize. 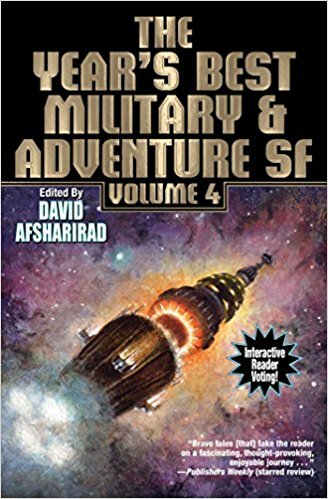 This entry was posted in Awards and tagged Baen Books, David Afsharirad, Kacey Ezell, Michael Z. Williamson, The Year's Best Military and Adventure SF Readers' Choice Award, Year’s Best Military and Adventure Science Fiction Story by Mike Glyer. Bookmark the permalink.